Art House Index (PUB). Exhibition in public space, Bucharest (RO). Vermeir & Heiremans present a publicity for Art House Index on an advertisement billboard in the city of Bucharest on the occasion of BB7. Design: Salome Schmuki. As established throughout the curatorial concept entitled What are we building down there? BB7 highlights the themes of privatization, commercialization, and corporatization of the post-socialist city within its very structure, thereby displacing the biennale onto twenty-one advertising billboards. 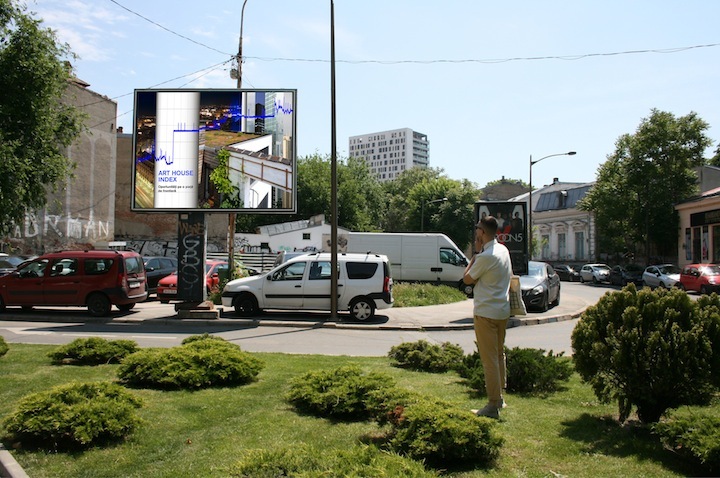 By organizing BB7 exclusively on advertising billboards, the biennale radically and publicly appropriates Bucharest smoothest and most visible two-dimensional commercial surfaces. A map and an app for iOS/Android is available to navigate the biennial. The publication of BB7 will be released in September 2016 by Onomatopee Projects.